Tess Somervell reviews The Salt Book of Younger Poets here. There is not a poem among the three or four by each of the fifty poets in this anthology which is not in some way intelligent; dominant, however, is a specific type of intelligence, an intellectual self-indulgence of an almost metaphysical character. The grand abstract concept is less the order of the day than the local image stretched to its figurative limit, a brief moment teased out to fill a poem. Only the British could reinvent metaphysical self-indulgence for the twenty-first century. 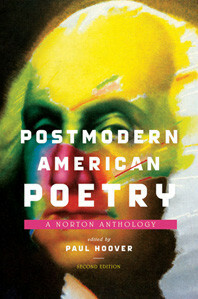 And someone should review the second edition of Paul Hoover’s immensely useful Postmodern American Poetry: A Norton Anthology. galvanized attention on its publication in 1994, making “the avant-garde accessible” (Chicago Tribune) and filling “an enormous gap in the publication annals of contemporary poetry” (Marjorie Perloff). Now, two decades later, Paul Hoover returns to suggest what postmodernism means in the twenty-first century. This revised and expanded edition features 114 poets, 557 poems, and 15 poetics essays, addressing important recent movements such as Newlipo, conceptual poetry, and Flarf. Bringing together foundational postmodern poets like Charles Olson, Denise Levertov, and Allen Ginsberg with new voices like Christian Bok, Kenneth Goldsmith, and Katie Dengentesh, this edition of Postmodern American Poetry is the essential collection for a new generation of readers. When Paul was compiling the first edition, I asked him why he hadn't included Dorn's Vaquero. No real answer. Now maybe someone can tell me why he needed to give a fresh tank of oxygen to that gasbag Goldsmith.